The sections on the Tenryu Furaibo TF39 slide together smoothly and precisely. The Nissin Royal Stage Syunki typifies the premium Japanese rods. The Nissin Zerosum 360 is a perennial best-seller for a reason. Like many tenkara anglers, I started with a couple of “brand X” rods of modest price and eventually caught quite a few fish with them. I still have these first rods and sometimes lend them to beginners. They serve their purpose, and I appreciate their reasonable value. Along the way, I was able to save up and buy other, nicer poles, including the higher-end Nissin and Suntech rods, plus a Tenryu Furaibo TF39. I really enjoy them and have managed to catch lots of stocker rainbows, panfish, catfish, largemouth and Guadalupe bass over the past 4 years. It’s been a wonderful, enjoyable experience, and I’ve treasured just about every trip on the water. I’m always learning something new. Recently, I decided to re-visit one of my cheaper poles and see if the intervening years offered any insights into the manufacture of tenkara rods. What are the differences between a $50 rod and one that may cost five times as much? Are the more expensive tenkara rods worth the extra price? Frankly, when I first started, my inexperience would have prevented me from telling the differences. My casting technique was poor, I didn’t know how to control the rod, or even how to extend and collapse it properly. My hand wasn’t tuned to slight variations in design, balance, and play. So, my handling of the less-expensive pole after years’ of absence was a real eye-opener. I’ll keep this short and just say that the main differences are the fit, finish, and quality of the carbon fiber tubes. Frankly, the sections on the cheaper rod felt, well, cheap. The sections did not slide together or collapse smoothly, and the manufacturing tolerances were inconsistent. I could actually feel the tubes wobble through the joints just the tiniest bit. 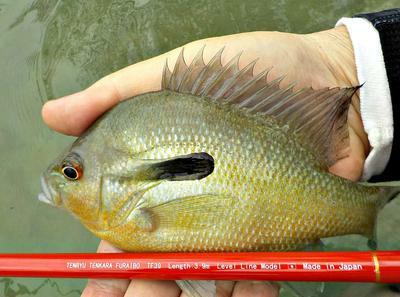 Though I caught several fish, I couldn’t present the fly as nimbly. Frankly, my outing was less enjoyable. I might add that a difference in quality is not easily seen in a picture; it’s felt in the hand. 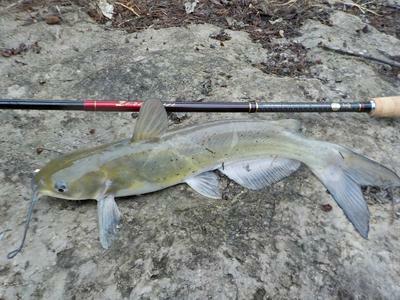 I have owned a rod or two that looked premium in the photo but felt cheap on the river. Again, I plan to keep my beginner rods. They serve a purpose and helped get me started. My suggestion for others, however, would be to aim for a nicer rod—one that’s either made by, or for, Japanese companies. There’s a difference that you can feel with every cast. If I were going to recommend a single rod for the beginner, it would be one of the zoom poles made by Suntech, but any of the better rods from the Japanese companies will make you proud. That’s one angler’s experience and opinion. John - You would have to put a picture of a Guadalupe bass in your line-up. My only frustration of my Texas trip last year was having several follow my fly right up to my feet with no takers! I was visiting with one of my fishing friends at work. He just bought his wife an inexpensive Tenkara Rod. 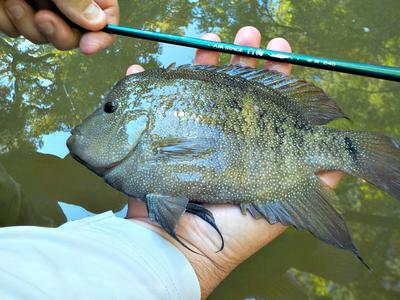 His opinion is that a Tenkara rod is nothing more than a fly rod without a reel. That set off a long conversation, as well as whipping out a TenkaraBum business card so he could come over to the website and get educated! Yes, those Guadalupe bass can be persnickety. One of the great little joys in life is to catch a Guadalupe bass in the Guadalupe River! I selected those four photos not only to show the rods, but to show a variety of warm-water fish available to the tenkara angler. Quality Counts, I try to buy Japanese, they are simply the best. Next Japanese quality control in other countries.